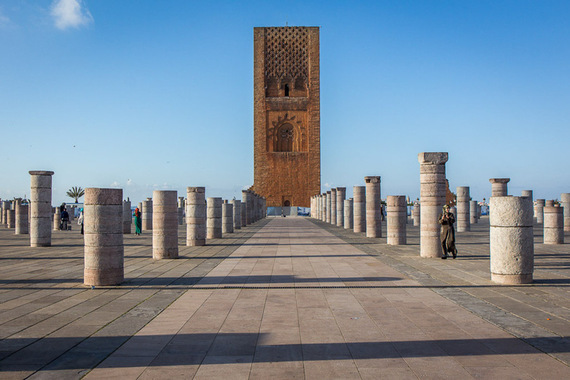 This North African country with a blend of Islamic and European influences offers opportunities to explore both its history and its modern day culture. Yes, I got lost many times -- but that's the best way to find the real treasures here. Lost in the maze of Marrakech, I pause for a moment to try to get my bearings. It's a mistake. Two young Moroccan men pounce on me and immediately strike up a friendly conversation. "We can show you where to go." The winding mass of little alleyways, lined with shops selling everything from carpets to lamps, is what makes this city's old Medina so mesmerizing. The aromas of spices hit your nose as you walk past a shop with large bags of cumin and cinnamon. A few more steps and meat on a grill pushes its way in as the dominant smell. It's a constant onslaught on the senses. I engage with the two guys offering to help me get back to my hotel. Another mistake. Before I know it, they have attached themselves to me and follow along like my new best friends. If I take a wrong turn, they tell me. Even though I know they're right, I try not to take their advice because I know where this situation is going, even if I don't know where I'm going. Eventually we do end up at my hotel and the friendly facade drops away. As expected, they ask for money. I give them the equivalent of a few dollars and they seem unhappy with the amount. But after a little argument they take the cash and leave, presumably to find another lost foreigner like me. Discover more of Michael's Moroccan finds on Findery. Rather than taint the experience, though, I find this is part of the charm of exploring Morocco. There's an unpredictability to every outing. Nothing is ever the same and the chaotic colorful cities offer as much with the people on the street as the historic buildings they hold. 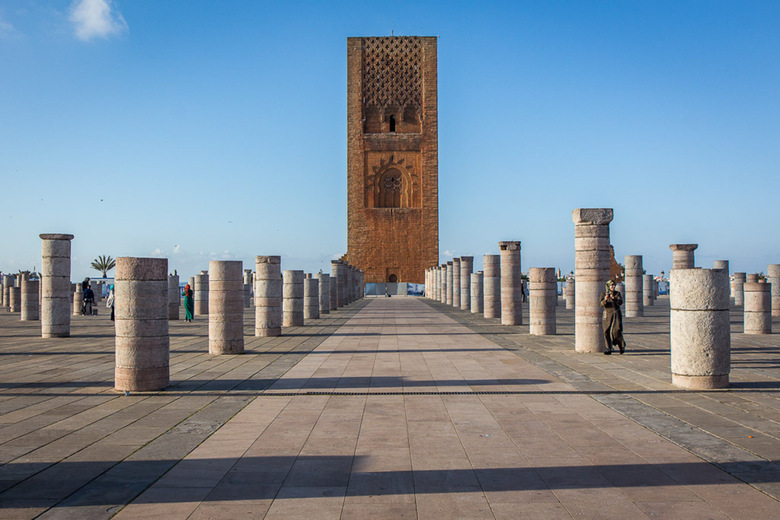 One of my aims in Morocco is to visit all nine of the country's World Heritage Sites (part of a challenge I set myself to see every one on Earth). 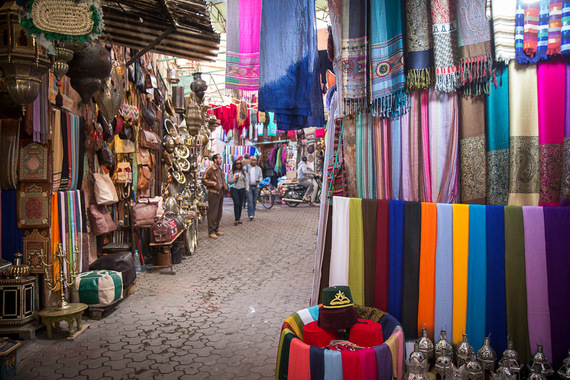 The old Medina of Marrakech is one and it is my introduction to the country. Much later on, by the time I arrive at the Medina of Fez (northeast of Marrakech), I am better prepared. The two cities have a similar atmosphere and are the most lively of Morocco's old walled medinas. Although Fez is larger, I find I don't get as lost. This time I enjoy the little details and the variations of the alleyways. In a small square, men sit on stools and beat copper pots into shape; open doorways allow me to peek into workshops where artists are carving wooden sculptures; undercover markets are full of jewelry that glistens under the artificial lights; and the streetside restaurants serve hot tagines eaten with loaves of bread. Sometimes I feel it is more enjoyable just to wander aimlessly for a day in an old part of the city than try to see all the famous sights. In the city of Meknes, not far from Fez, however, it is the historic buildings which are the highlight. This was the site were the ruthless and ambitious leader, Moulay Ismail, built his capital in the 17th century. While the Imperial Palace is off limits to tourists, there's still more than enough to see. 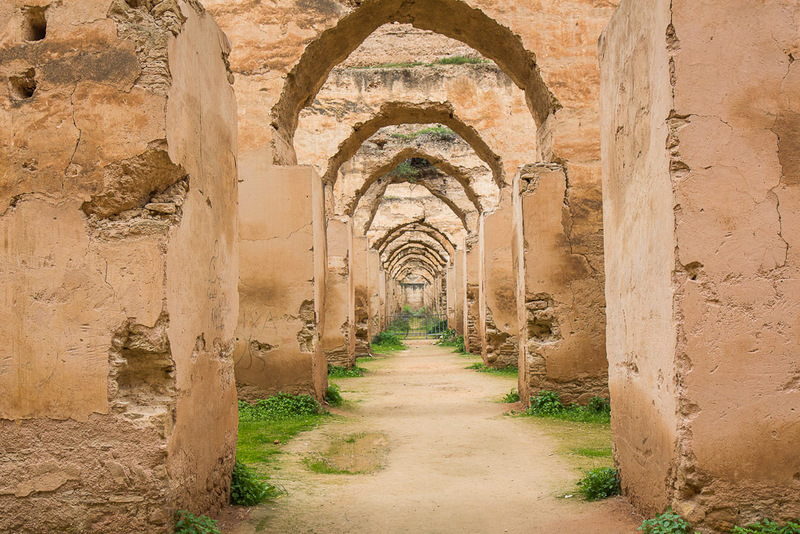 The Mausoleum of Moulay Ismail is appropriately grand and the enormous granaries and stables on the edge of town show how wealthy Meknes once was. Perhaps the most startling sight is the underground prison where up to 100,000 slaves were chained to the walls at night after working all day building the leader's legacy. 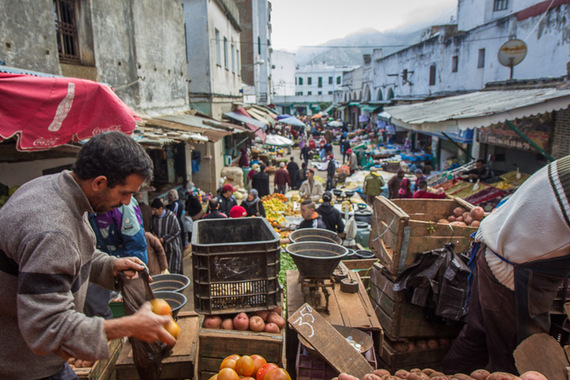 For a much quieter and more relaxing medina, I head to the city of Tetouan, at the north of Morocco. This is one of the smallest remaining old cities in the country and is a real contrast to the hectic (and more famous) cities. Tetouan is significant because of its proximity to Europe. 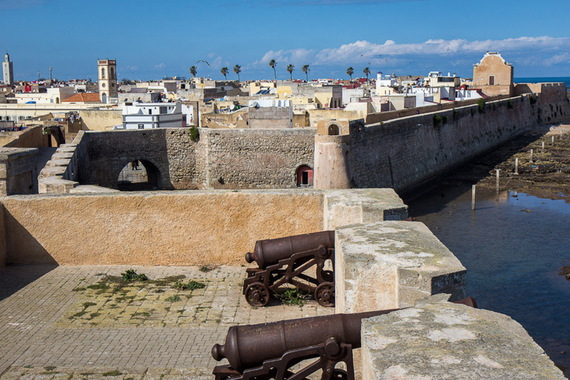 Spain is just a short trip across the water and, historically, Tetouan was the link between it and North Africa. I arrive on Monday -- market day -- and so it is as bustling as it gets. The stalls which fill the lower streets of the medina are spilling out into the streets surrounding the ancient wall that still stands and only permits entrance through the grand gates. It doesn't take long to explore and there's little chance of getting lost. Heading south down Morocco's coast, past Casablanca, I get to the city of El Jadida. On an outcrop by the sea is the old fortress of Mazagan. It is miniature compared to the other walled cities listed as World Heritage Sites and only takes 30 minutes or so to walk through - but it didn't need to be big. It was built by the Portuguese in the early 16th century as an outpost in the trading route down the west coast of Africa. The high walls like cliffs on a coastline with great views across the sea were never penetrated by enemies during the centuries it was in use. Eventually the Portuguese left Mazagan as part of a peace agreement, but not before they booby-trapped the entrance with explosives. 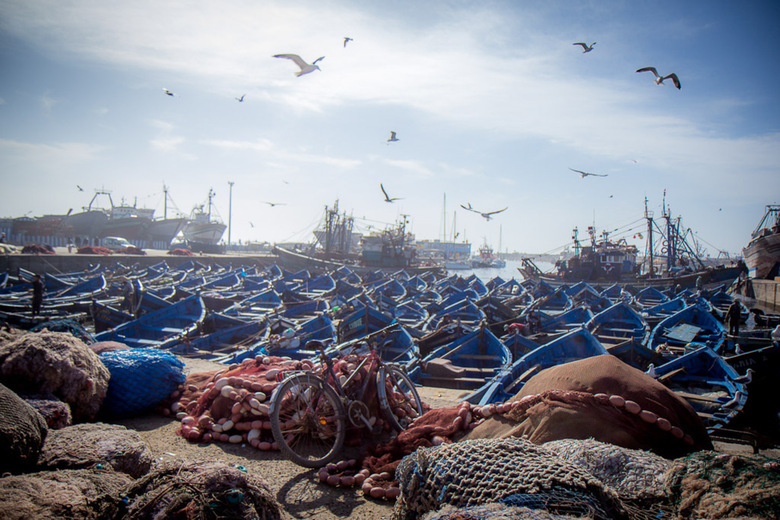 One of Morocco's most scenic medinas can be found even further down the coast at Essaouira. This seaside city is popular with travelers for its long yellow beach with surfers out on the water and camels on the sand. But it's the old town that has the official heritage significance. I find myself spending most of my time in the port, just outside the main walls. The scene is a spectrum of blues -- the sky and the sea, obviously -- but even the boats, the nets and the boxes of fish are colored blue. Seagulls fly overhead and the day's fresh catch is sold almost straight from the boat. If Essaouira captures the relaxed holiday opportunities in Morocco, the country's capital Rabat is the opposite. It is a modern and efficient city where wide boulevards run between expansive government properties. 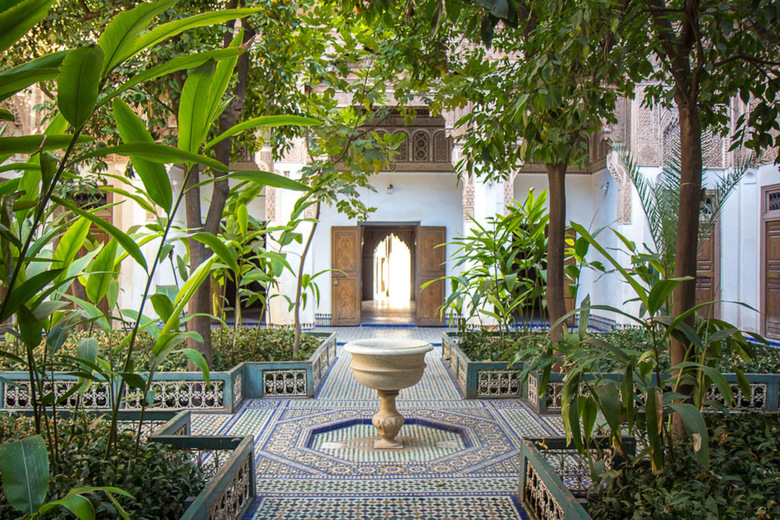 However, it is also on the World Heritage List because of the blend of modern imperial palaces built in the early 1900's by the French and the ancient citadels and Islamic structures from 800 years earlier. I enjoy the old fortress of Chellah on the edge of town and the unfinished Hassan Mosque with just a lonely tower. The kasbah by the sea is also beautiful at sunset. However, I'm left a bit underwhelmed by Rabat which seems to have lost the dynamism of Fez or Marrakesh through the presence of the national institutions. In the desert, over the Atlas Mountains and far from any of Morocco's major tourist cities, is a truly unique World Heritage Site. 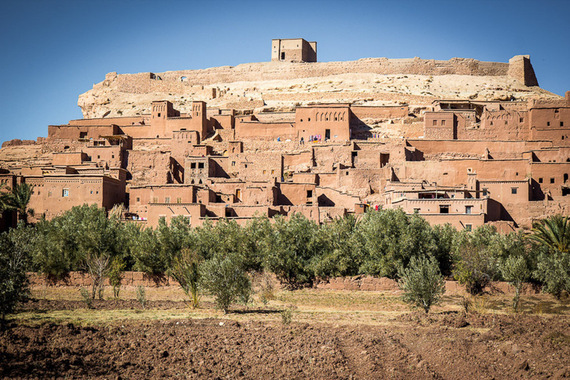 The Ksar of Ait-Ben-Haddou rises up a hillside from the dusty plain below it. The site is a fortress built in the 17th century from mud-like substance -- wet dirt mixed with straw and rubble packed together tightly. As I climb up the different levels past the small houses and shops inside the earthen citadel, I feel like I've been transported back centuries in time. It's no wonder that the producers of the Game of Thrones television show used the Ksar of Ait-Ben-Haddou as a set for one scene. But well before a Moroccan tribe built Ait-Ben-Haddou on a popular trading route, another empire had established itself on this land. The great Roman Empire. 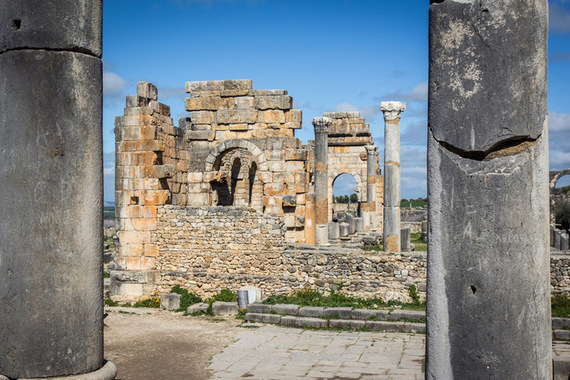 At the site of Volubilis in the middle of Morocco, are the ruins of an affluent Roman outpost. I spend about two hours walking through the ruins by myself, imagining what the city here would have been like almost two millennia ago. The fertile lands around it were perfect for agriculture and the city thrived and was expanded several times. Although there are plenty of local men at the entrance offering their services as guides, I enjoy the serenity of an ancient city by myself. Volubilis is a long way from the Medina of Marrakech -- both geographically and culturally. This, again is part of the charm of Morocco. 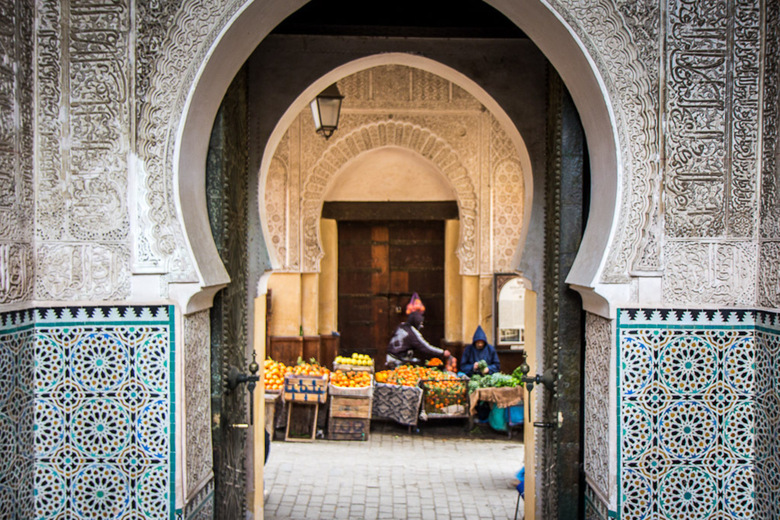 This North African country with a blend of Islamic and European influences offers opportunities to explore both its history and its modern day culture. Yes, I got lost many times -- but that's the best way to find the real treasures here. Post by Michael Turtle of Time Travel Turtle, find him on Findery.